Must be how Don Draper got his start. Everywhere there’s conflict there seems to be pipelines. A while back I posted a map of the Russian pipelines going through Ukraine and then to Europe. 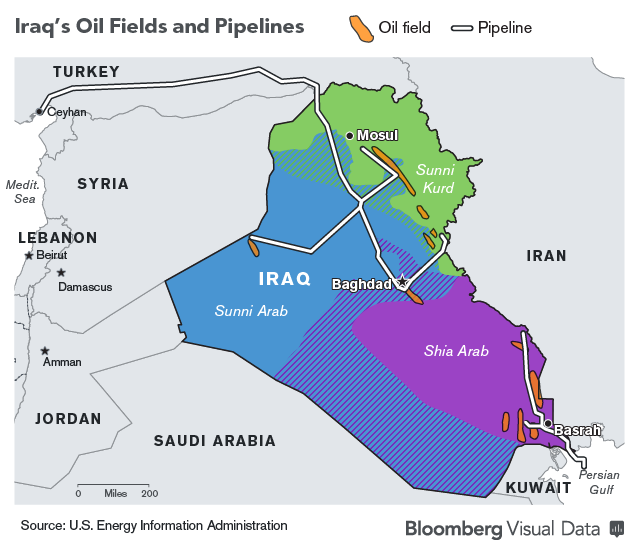 Now according to the map, the oil refineries and pipelines seems to be safe. I would also assume the ones controlled by the Kurds in the North to be out of the conflict zone. Everything in the middle seems to be a mess. 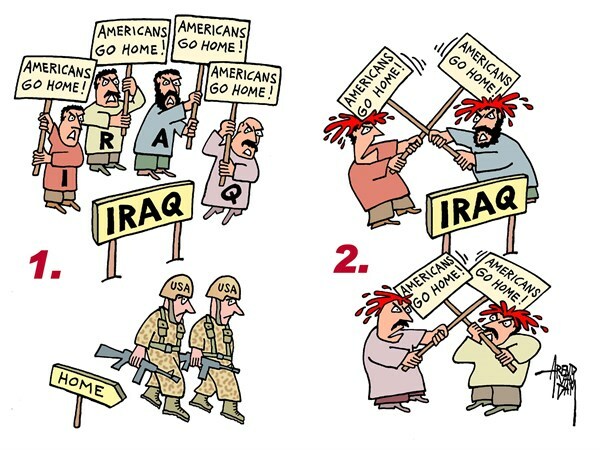 I’m really trying to understand this latest Iraqi conflict. So I’m turning to the Reddit community for help. The last I heard is that Iraq asked the U.S. for help to take out the rebel group ISIL. ISIL is a Sunni muslim group and is also one of the group trying to topple Syria’s President Bashar al-Assad. ISIL apparently got kicked out of Al Qaeda because they were too extreme. Now here is the confusing part. The U.S. were also trying to get rid of President Bashar al-Assad and in the process were arming and supporting the rebels’ cause. In Syria ISIL are considering freedom fighters. In Iraq they are considered terrorists/militants. So is the U.S./Iraq about to bomb the same group that wants Assad out? This is my latest research article. The sale of the Clippers is taking all the attention. MSG is the company the buy and has been overlooked. Below is an extract of my research. Click on the Seeking Alpha link for the full research and this one is a free article. I’m disappointed that you couldn’t buy the LA Clippers. I am sure you would have made a great owner and you would have been the perfect response to the Donald Sterling debacle. However, I am delighted to inform you that I have found a better opportunity for your billions. First, let’s start with a refresher. How did the Clippers get away? It’s probably mentally destabilizing knowing you couldn’t buy something. The press coverage of the LA Clippers has focused on its gargantuan sale price and its highly publicized list of celebrities, billionaires, and crowdfunding projects that have expressed interest in buying the LA Clippers. In the end, it was your pal on the Bloomberg Billionaire list, Steve Ballmer, the 39st richest man in the world, who bought the team with his $2 billion bid. This represents 10% of Mr. Ballmer’s net worth and turns out to be an expensive asset diversification strategy. Unfortunately, Mrs. Winfrey, there was a good chance you were going to overpay when Frankie Muniz (Malcolm in the Middle) announced he wanted to buy LA’s B-Team. The circus might be explained in part by the $2 billion sale price. That price is very mesmerizing since the Clippers spent the last three decades rotting in the shadow of the glamorous Lakers until recently thanks to Chris Paul and Blake Griffin. Also, for $2 billion, the Staples Center is not included since it’s owned by AEG (don’t worry Mr. Ballmer, Sterling negotiated a good cheap lease). Forget the Clippers, a better place for your savings is to look at the Madison Square Garden Company (MSG), which owns the New York Knicks and has a stronger underlying business. MSG is more than just “The World’s Most Famous Arena”, it’s an entertainment juggernaut that contains a diverse collection of trophy assets and iconic brands such as Knicks, The New York Rangers, the Rockettes, the Radio City Christmas Spectacular and a variety of other entertainment assets. 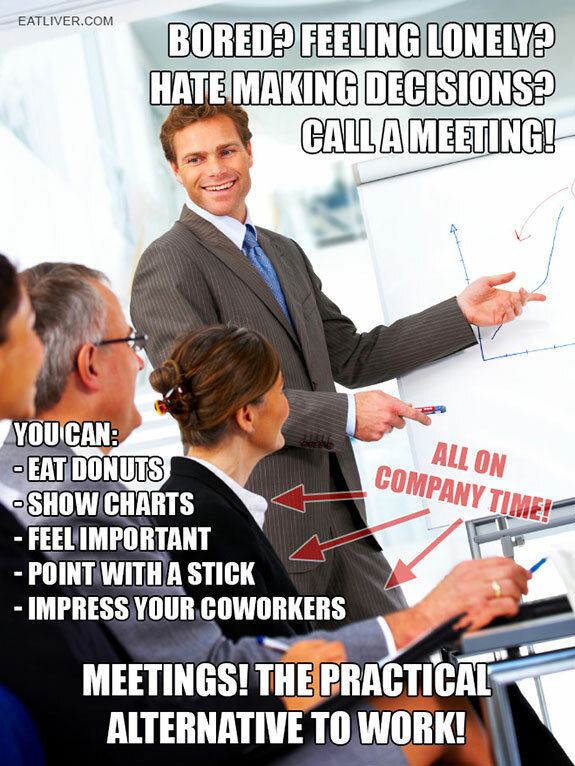 The best part is that the sports teams are not even the most valuable part of the business. There’s also a very lucrative media division that’s throwing off of lot of cash. Buying a fractional interest of the MSG Company is a much better investment than throwing your hard earned billions at the Clippers. (Side note to Oprah: The NYR are battling for Lord Stanley’s Cup. Please note that I’m not jumping on any bandwagon and this is not a cheerleading article. I’m not a Knicks or a Rangers fan, I’m a Habs fan). While the sale of the Clippers is making headlines, the MSG Company is under the radar. The purpose of this research is to demonstrate that MSG is currently undervalued. A sum-of-the-parts approach suggests that MSG is worth much more than the current market price. I believe the market understates MSG’s cash flow potential and its collection of trophy assets. Based on my valuation, the implied intrinsic value of the Madison Square Garden Company is in the range of $6.4 and $7.5 billion, or $84 to $97 per share, this implies a potential upside of 50% to 74% from the current price of ~$56. There are many catalysts that could unlock the value. A combination of increasing free cash flow generation, a “new” renovated Garden, issuing a regular dividend, announcement of share buybacks, a championship run, a new superstar, higher sports media right fees, extended labor peace, a growing international business, a buyout offer, a spin off of the real-estates or different segments, or a take private transaction could fuel the MSG Company upward. Also, the sale of the Clippers should be beneficial on the valuation of all the NBA teams, especially an iconic team like the Knicks. It’s in the best interest of the NBA and its owners to have immense sale prices. That helps drive up the sale of the next team. Oprah, with MSG trading at approximately $56 a share, it’s a nice entry point to stash your billions. Today, you can buy a fractional interest of MSG via Class A shares on the open market without having Justin Bieber in the way. 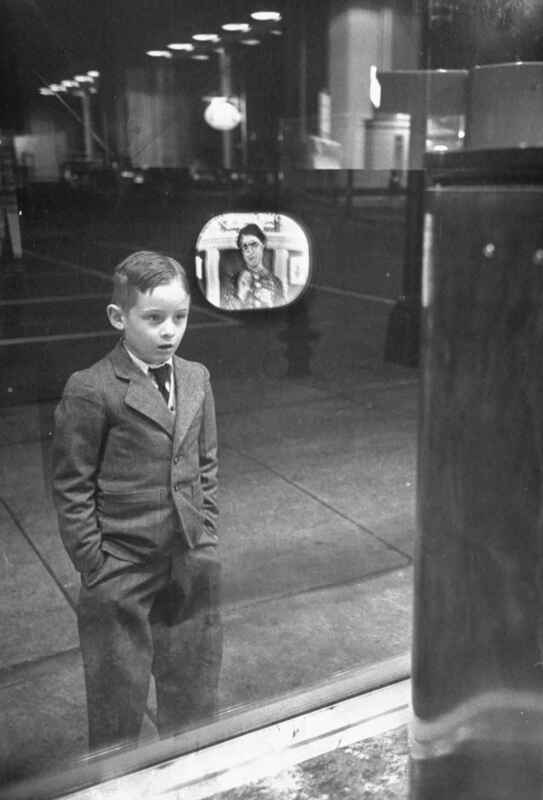 However, there are other people in the way. In case you decided to buy the entire company, you might have to wrestle for power from the Dolan family since they still control MSG via super-voting shares (they own all the Class B shares). I saw your show and what you are capable of doing. If you can work with Lance Armstrong, I’m sure you can also stage a sit-down interview to loosen him up (James Dolan) to the possibility. 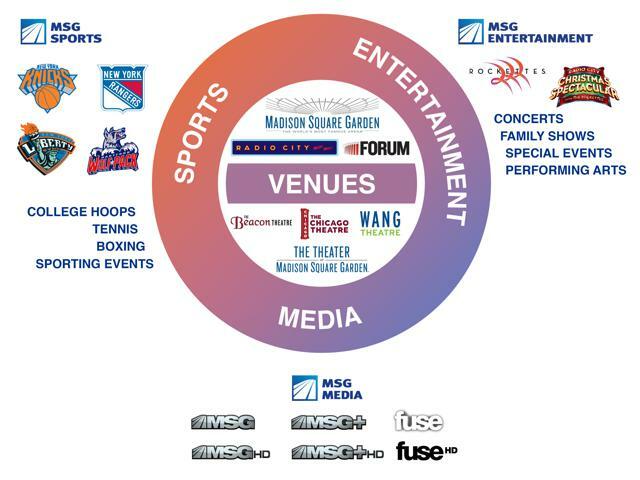 In its annual report, the Madison Square Garden Company is described as a fully-integrated sports, media and entertainment business. The company is comprised of three business segments: MSG Sports, MSG Media and MSG Entertainment. The divisions are strategically aligned to work together to drive the MSG’ overall business which is to create, produce, and present content and distribute it through its programming networks and other media assets. The MSG Sports segment owns and operates the New York Knicks, the New York Rangers, the New-York Liberty, and the Hartford Wolf Pack. MSG Sports also presents other live sporting events. MSG Media includes MSG, and MSG+, MSG HD, MSG HD+. Fuse was recently sold to SiTV/NunoTV (backed by Jennifer Lopez) for $226 million in cash and 15% equity. MSG Entertainment has a live entertainment portfolio, such as concerts and special events. The segment also operates leading venues such as the Madison Square Garden, the Radio City Music Hall, the Beacon Theatre in Manhattan, the Wang Theatre in Boston, the Chicago Theatre and the Forum in Inglewood, Calif. This is the introduction. The rest of the research is on Seeking Alpha, here. During my investment research for MSG I found some really nice looking stock certificate of old publicly traded sports team. Pure play publicly traded sports team is a rare thing. It doesn’t happen often and when it does control is rarely given. In Europe there are a few soccer (football for the purists) teams are listed on the stock market. 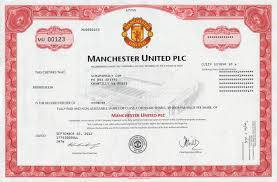 In North America, at the moment there’s Manchester United (MANU) that’s listed on the NYSE. Not exactly a local team but the owners, the Glazer family, are American. 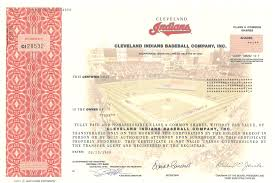 I added some stock certificates of American sports team that use to trade publicly. They are more like novelty investments and gives the stockholder a “fake feeling of ownership”. 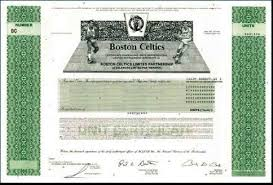 You will find a stock certificate of the Green Bay Packers, the Boston Celtics, the Florida Panthers, the Cleveland Indians, and Manchester United. The extract below is taken from my research on The Madison Square Garden Company. For the full report click here. I did some research on other publicly traded sports teams and there isn’t much. It’s definitely not a popular sector. Most of publicly traded sports teams are soccer “football for the purists” teams in Europe and do not constitute a good base. I can’t really use them as comparable. In America, publicly traded companies pure plays are rare. The Rangers and the Knicks are part of a bigger company. The Toronto Maples Leafs is a small part of telecommunication giant Rogers and BCE. BCE also owns 18.4% of the Montreal Canadiens and the Atlanta Braves is one of the many assets inside Liberty Media. Usually the primary appeal of these stocks would the fans since little or any control is given. Just like MSG, you are not the “real” owner. The only pure play I found is Manchester United (MANU). Only a small portion of MANU is publicly available and the company is controlled by the Glazer family. MANU had their IPO in 2012 at a price much lower underwriters expected because the fan base of retail investors didn’t show up. At the moment MANU is trading around $16 a share. As a side note, this wouldn’t have been the first time MANU is publicly traded. The Glazer family bought out the shareholders in 2004. 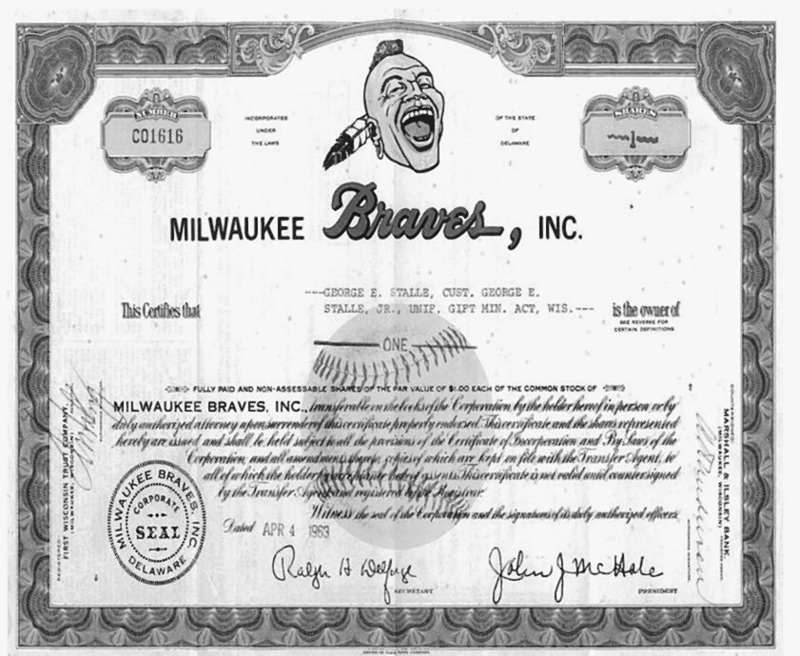 The graphic above is a certificate of the Milwaukee Braves, the same team that moved to Atlanta. They were never publicly traded and shares were sold to a few hundred locals. However you can indirectly invest in the Atlanta Braves. Liberty Media Corporation (LCMA); it owns and operates the Atlanta Braves as a part of their media empire. I must admit that’s one nice stock certificate. 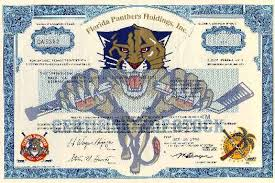 The 1996 Florida Panthers (PUCK) went public on the NASDAQ. Florida Panthers Holdings was Wayne Huizenga’s investment company. It’s wasn’t a sport pure play since the holding was filled with real estate and entertainment assets. In 1997 the Panthers made the move to the NYSE with a new symbol: (PAW), since the NYSE limits trading symbols to a maximum of three letters. The stock had ups and downs to eventually change its name to Boca Resorts. Mr. Huizenga sold the Panthers in 2001. You can see from the table below that the Panther’s had terrible cash flow. The Boston Celtics (BOS) had a long public run. 40% of the team was offered to the public in 1986 at $18.50 a share. The Celtics were traded publicly until 2002 when the team became privately owned for $360 million. The Green Bay Packers have a different ownership structure. The team is owned by the fans. 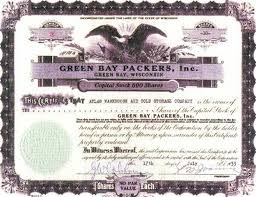 The Packers sold their first shares for $5 in 1923. It’s not publicly traded. There are significant restrictions on all transfers. Presentably, 364,114 people, representing 5,014,545 shares can lay claim on the franchise. Shares include voting rights but redemption price is minimal and no dividends are paid. The stock cannot appreciate in value. Other than interesting history, it doesn’t really help with the valuation of MSG. It appears that some of the investments above were novelty investments. Team owners often issue public offerings in order to monetize their holdings without losing team control. However, if MSG was ever going to break up, it might indicate that the Knicks and Rangers might be better off privately. I don’t think a professional sports team should be on the stock market. The team should be owned privately by an owner that wants to win rather than focusing on beating next quarter’s number.